Kevin McHale and Grant Hill give their input on JR Smith and the Cavaliers agreeing to part ways. Jordan Clarkson scores 24 points, Tristan Thompson ties a career-high 21 boards as the Cavaliers cruise past the Hornets, 113-89. Zach LaVine scores 24 points and gets eight rebounds to help the Bulls edge the Cavaliers in a 99-98 win. Dennis Schroder scores 28 points and Paul George adds 18 as the Oklahoma City Thunder win their sixth straight by taking care of the Cleveland Cavaliers on the road, 95-86. Kemba Walker finishes with 18 points as Charlotte snaps a nine-game losing streak against Cleveland by getting it's largest win ever over the Cavaliers, 126-94. Ernie, Shaq, Kenny and Chuck weigh in on the reports of JR Smith allegedly wanting a trade and Larry Drew not wanting to be tagged as an interim head coach. Kawhi Leonard posts a double-double in his first game as a Raptor as Toronto defeats Cleveland, 116 - 104. Ante Zizic scores 20 points off the bench and Collin Sexton adds 13 in his first start as the Cavaliers defeat the Celtics, 113-102. J.R. Smith sinks stepback baseline jumper. JR Smith and Marcus Smart get into an altercation in the first quarter which results in a technical foul for Smith and Smart being ejected. JR Smith leaves a comment on Instagram suggesting the Knicks have a chance to land Kyrie next season and Isaiah Thomas gives his thoughts on the possibility. Be sure to check out the Cleveland Cavaliers top 10 plays of the season! Played in 77 games (all starts) with Cleveland…averaged 12.4 points on .415 shooting, 2.8 rebounds and 1.1 steals in 30.7 minutes per game…shot .400 from the three-point line, which was tied for 17th in the NBA…ranked 7th in the NBA in three-pointers made with a franchise single season record 204 triples…currently ranks 17th in NBA history in three-pointers made with 1,679…made at least one three-pointer in 65 of 77 contests…nailed at least two three-pointers 50 times, three or more three-pointers on 36 occasions, four or more three-pointers 25 times, five or more triples 15 times and six-plus three-pointers on nine occasions…his 15 games with five or more threes were the most in the East and the most in franchise history…hit seven three-pointers on three occasions; has 28 career games with at least seven three-pointers made, the second-most in NBA history…led the Cavs in steal-to-turnover ratio at 1.37…recorded one double-double…scored 10 or more points 50 times and 20 or more points 11 times on the season; scored a season high 27 points twice…had 21 games with at least two steals and 10 games with three or more steals; Swiped a season-high tying four steals on three occasions…made the most three-pointers in the Eastern Conference since Jan. 1 with 151…dished out a season-high seven assists at Memphis on Oct. 28…made his 1,500th career three-pointer with his second trey at Toronto on Nov. 25…had a career-high four blocks against Brooklyn on Nov. 28…swiped his 800th career steal at Denver on Dec. 29…scored at least 24 points in three straight games (Jan. 4-8), his first time doing so since April 2-6, 2014…made a season-high 8-14 (.571) shots from the three-point line and finished with 24 points and three rebounds in 30 minutes in a win over Toronto on Jan. 4; marked his 14th career regular season game with at least eight three-pointers, the 2nd-most in NBA history…had a season-high 27 points on 10-12 (.833) shooting from the field, including 5-6 (.833) from beyond the arc, and two steals in just 19 minutes at Minnesota on Jan. 8; became the first Cavs player to ever finish with at least 27 points in under 20 minutes in franchise history…became the 18th player in league history to make 1,600 career three-pointers with his fifth triple against Sacramento on Feb. 8…moved past Jason Richardson (1,608) for 17th all-time in NBA history in three-pointers made with his fourth triple at Oklahoma City on Feb. 21…also surpassed Mike Miller (1,577) for 18th all-time in three-pointers made at Indiana on Feb. 1; Glen Rice (1,559) for 19th all-time in NBA history in three-pointers against the L.A. Clippers on Jan. 21; Tim Hardaway (1,542) and Eddie Jones (1,546) for 21st and 20th at Minnesota on Jan. 8; Nick Van Exel (1,528) for 22nd against Orlando on Jan. 2; Mike Bibby (1,517) for 23rd at Golden State on Dec. 25…notched a double-double in his 800th career regular season game after tallying 18 points and a season-high 11 rebounds in 39 minutes versus Chicago on Jan. 23…moved past Chris Mills for 10th place in Cavaliers history in three-pointers made at Orlando on March 18…shot 10-16 (.625) from the field, including 6-9 (.667) from beyond the arc, for a season-high tying 27 points while posting five rebounds, three assists and one steal in 33 minutes versus Charlotte on April 3…broke Wesley Person’s franchise single-season record of 192 three-pointers (1997-98) with his third of seven triples at Milwaukee on April 5, the same night when he reached 11,000 points for his career (13th point of the game)…led or tied for the team lead in steals 21 times, blocks 10 times, points three times and in assists two times…was a DNP-CD three times, a DND once and a NWT once…missed three games from 11/4-11/8 due to a right knee contusion, quadriceps tendinitis; missed one game on 4/13 due to rest. Owns career averages of 13.2 points, 3.2 rebounds, 2.2 assists and 1.0 steal in 26.9 minutes in 839 games (295 starts) over his 12-year career with New Orleans, Denver, New York and Cleveland…owns four 40+ scoring games, all with Nuggets (career high 45 pts vs. Kings, Apr. 13, 2009)...currently ranks 17th in NBA history in three-pointers made with 1,679…has 14 regular season games with at least eight three-pointers, which is the second-most in NBA history…also has 28 games with at least seven three-pointers made, second-most all-time in league history…played in 70 games (51 starts) with Cleveland and New York in 2014-15…averaged 12.1 points on .417 shooting, 3.1 rebounds, 2.8 assists and 1.2 steals in 29.7 minutes per game…shot .383 from the three-point line and .750 from the free throw line…ranked 11th in the NBA in three-pointers made (163) and in three-pointers made per game (2.3)…nailed three or more three-pointers on 27 occasions, including five or more triples 11 times…made 131 three-pointers after his first game as a Cavalier on Jan. 7, which was the third-most in the NBA behind only Golden State’s Stephen Curry (192) and Klay Thompson (149)…hit a season-high eight three-pointers three times in 2014-15 (at PHX 1/13, vs. CHI 4/5 & vs. DET 4/13)…scored 10 or more points 39 times and 20 or more points 13 times on the season…had 21 games with at least two steals and 12 games with three or more steals…in 24 games (six starts) with the Knicks, averaged 10.9 points, 2.4 rebounds and 3.4 assists in 25.8 minutes…in 46 games (45 starts) with the Cavs, averaged 12.7 points, including a .390 clip from beyond the arc, 3.5 rebounds, 2.5 assists and 1.4 steals in 31.8 minutes…made at least one three-pointer in 38 of 46 contests with the Cavs, including 19 straight games with a three-pointer from Feb. 27- April 8…led the Cavs in steal-to-turnover ratio (1.23)…made the most three-pointers in the Eastern Conference since Jan. 13 with 128…in his first start as a Cavalier on Jan. 9 at Golden State, tallied 27 points, while grabbing five rebounds in 42 minutes; became just the sixth player in Cavaliers history to score at least 27 points in their first start, joining Johnny Davis (33 on 10/30/84 at DET), Jeremy Pargo (28 on 11/21/12 vs. PHI), C.J. Miles (28 on 12/11/12 vs. LAL), Ron Anderson (27 on 10/26/84 at PHI) and Walt Wesley (27 on 11/7/70 at BUF)…swiped a career-high tying five steals against the L.A. Clippers on Feb. 5…nailed his 1,396th career three-pointer to pass Brent Barry for 25th in league history against Miami on Feb. 11…hit his 1,400th career three-pointer at Washington on Feb. 20…pulled down a season-high 10 rebounds at Houston on March 1…dished out a season-high seven assists twice…recorded his NBA-record 23rd career game with at least seven three-pointers, surpassing Ray Allen (22), after nailing 7-9 (.778) shots from deep and tallying 23 points on 8-11 (.727) overall shooting, four rebounds, and three steals in 37 minutes at Milwaukee on March 22…surpassed 10,000 points for his career at Brooklyn on March 27…moved past Michael Finley (1,454) for 24th all-time in three-pointers made with his first triple against Miami on April 2…nailed a season-high tying 8-17 (.471) shots from beyond the arc for 24 points in 43 minutes against Chicago on April 5…led or tied for the team lead with the Cavs in steals 12 times, blocks six times, points four times and in assists four times…was a DNP-CD on one occasion due to rest on April 12…with New York, was a DND nine times, a NWT three times, one game due to a suspension and one game due to flu-like symptoms …also missed three games with the Knicks due to a sore left heel and seven games due to a partially torn left plantar fascia…during the 2013-14 season, averaged 14.5 ppg (second on team to Anthony’s 27.4) on .415 overall shooting (396-955) over 32.7 mpg in 74 games (37 starts) for New York...went 189-480 (.394) from Downtown (career-high 189 3PT FGM), as his 189 3PT FGM marked the second-highest single-season mark in Knicks history (Starks 217 in 1994-95)...finished 10th in the NBA in 3PT FGM (career-high 189, tied with Denver’s Randy Foye) and 25th in 3PT FG pct. (.394)...season Highs: Points: 32 (twice); Assists: 7 (twice); Rebounds: 10 (Dec. 23 at Orlando)...led Knicks in scoring five times, assists 11 times...had 12 20+ scoring games and four 30+ scoring games (only Knick besides Anthony to record a 30+ scoring game in 2013-14)...had one pt-reb double-double (18 pts, season high 10 rebs on Dec. 23 at Orlando)...Logged 40+ minutes 10 times...recorded 2,000th career rebound on Nov. 23 at Washington...suffered fractured left cheekbone in loss at Oklahoma City, Feb. 9…did not dress (fractured left cheekbone) on Feb. 12 vs. Kings, the first game he missed due to injury as a Knick...fitted for plastic mask, and wore mask for next 18 games (through Mar. 23 vs. Cavs)...ranked 10th in the NBA in 3PT FGM (189, tied with Denver’s Randy Foye) and 25th in 3PT FG pct. (.394)...his 189 3PT FGM were a career high and the second-best single-season mark in Knicks franchise history, surpassed only by John Starks’ 217 in 1994-95...from Downtown, had five four-homer games, six five-homer games, two six-homer games, one eight-homer game (Apr. 4 vs. Wizards) and one nine-homer game (Mar. 26 at Sacramento), along with his record-breaking 10-home run game at Miami on Apr. 6...had 12 games with 10+ 3PT FGA, including his NBA record 22 3PT FGA at Miami, Apr. 6...went 24-50 (.480) from Downtown over a three-game span (Apr. 2-6), establishing an NBA mark with 24 3PT FGM over a three-game stretch (Elias)...as a starter (37 games, Knicks 20-17), averaged 16.5 ppg (610) on 223-537 FGA (.415) with 120-295 (.407) from Downtown over 34.4 mpg (1,274)...scored 20+ points nine times as a starter...came into the season having made just one start in 115 games as a Knick (Mar. 9, 2012 at Milwaukee; 3 pts, 18 mins)...started 26 of his last 28 contests (Feb. 21-Apr. 16)...off the bench (37 games), had 12.5 ppg (461) on 173-418 FGA (.414) with 69-185 (.373) from Downtown over 31.0 mpg (1,147) off the bench, with three 20+ scoring games...authored a record-shattering performance en route to 32-point outing in ABC matinee loss at Miami, Apr. 6, going 10-for 22 from three-point range in 43 starting minutes...his 10 three-pointers established a Knicks single-game record, breaking the mark of nine that he shared (on Mar. 26 at Sacramento) with Latrell Sprewell (twice), Carmelo Anthony (2013), Toney Douglas (2011) and John Starks (1998)...it was J.R,’s third career double-figure home run game (11 for Denver vs. Sacramento, Apr. 13, 2009; 10 for Denver vs. Atlanta on Dec. 23, 2009)...tied NBA single-game 2013-14 season high with 10 3PT FGM (one of six players to do it)...also established new NBA records for most three-point FGA in a game (22) and in a half (14 in second half)…tied a season-high with 32 points (had 32 pts in back-to-back games, also on Apr. 4 vs. Wizards)...off-the-bench double-double in win at Orlando with 18 points and season-high 10 rebounds (only double-double of season), Dec. 23...only Knicks starter in double-figure scoring (20 pts) in Christmas Day loss to Thunder...scored 30 points (6-11 from Downtown) in vintage 39 bench minutes in loss at Milwaukee, Feb. 3, teaming with Anthony (36) for Knicks’ only 30-30 duo of season...scored 10 points (4-14 FGA) in career-high 49 starting minutes in 2OT loss at Orlando, Feb. 21...tied then-Knicks’ single-game record with nine (of 12) three-point FG for 29 points in win at Sacramento, Mar. 26…nailed three three-pointers in the fourth quarter including game’s biggest shot: three-point bomb with 4:10 left to give NY a 99-94 lead after Kings had cut 24-point Knicks lead down to two...poured in game-and-season-high 32 points (8-16 from Downtown), but missed on potential game-winning three-ball at the buzzer of loss to Wizards, Apr. 4…first of back-to-back 32-point games (also in 10-home run game vs. Miami, Apr. 6)...scored game-high 30 points with career-high-tying five steals in just 27 starting minutes in season finale win over Raptors, Apr. 16...suspended without pay for five games by NBA for violating the terms of the NBA/NBPA Anti-Drug program, Sep. 6, and missed regular season’s first five contests...DNP (CD) twice...fined $25,000 by the NBA for directing hostile and inappropriate language to another player via his Twitter account, Nov. 15...fined $50,000 by the NBA for recurring instances of unsportsmanlike conduct, Jan. 8….during the 2012-13 season, appeared in 80 games for New York (all off the bench) and averaged career-high 18.1 ppg (18th in NBA) over 33.5 mpg...went 155-436 (.356) from Downtown...led Knicks in scoring 16 times, rebounds 11 times, assists 10 times...had a League-leading 29 20+ scoring games off the bench (tied with Clippers’ Crawford), including seven 30+ efforts...notched career highs in total minutes (2,678), total points (1,446), total rebounds (425) and scoring average (18.1)...had three straight 30+ games off the bench, Mar. 26-29, with 34.7 ppg (104), first NBA player to accomplish feat since Bucks’ Ricky Pierce in 1990...ejected twice in regular season (Feb. 20 at Indiana, Mar. 11 at Golden State) and once during Playoffs (Game Three of first round vs. Boston)...Eastern Conference Player of the Week for period ending Mar. 31, averaging 29.8 ppg (119)...scored season-high 37 points in win over Bobcats, Mar. 29...Game-high 25 points (season-high 7-14 from Downtown) in rout of Kings, Feb. 2...game-high 35 points (10-18 FGA, 12-13 FTA) in win over Grizzlies, Mar. 27. Set single-game career highs for FTM (12) and FTA (13)...main cog in ABC win at Oklahoma City with 22 points, Apr. 7…nailed game’s two biggest shots late in the fourth quarter: step-back jumper with 1:30 left (117-113 NYK) and 28-foot three-point bomb to beat the shot clock with :56.8 left (120-113)...career-high 14 rebounds with 28 points in OT loss at Chicago that snapped 13-game winning streak, Apr. 11...authored a pair of game-winning, game-ending, buzzer-beater shots, on Dec. 5, 2012 at Charlotte and Dec. 26, 2012 at Phoenix...became first Knick ever to have two game-ending, game-winning shots in one season since list compiled back to 1980...on Dec. 5, 2012, drilled an 18-foot step-back jumper from the left wing at the buzzer to lift Knicks to come-from-behind, 100-98 win at Charlotte...on Dec. 26, 2012, nailed a twisting, 21-foot jumper from the left baseline at the buzzer to give NYK last-ditch 99-97 win at Phoenix, capping 27-point night (Knicks’ most recent game-winning, game-ending buzzer-beater entering the 2014-15 season)…became free agent, Jul. 1, 2013; re-signed with Knicks, Jul. 11, 2013...underwent patella tendon surgery and an arthroscopy for a tear in the lateral meniscus, left knee, on Jul. 15, 2013…during the 2011-12 season, signed with the New York Knicks as a free agent on Feb. 17, 2012...averaged 12.5 ppg over 27.6 mpg in 35 games (one start)...signed with Knicks after starting season with Zhejiang of Chinese Basketball Association...from Downtown, had two seven-homer games (Mar. 14 vs. Blazers, Apr. 17 vs. Celtics)…in both of his seven-homer games, connected for seven three-pointers in one half (second half on Mar. 14, first half on Apr. 17), to tie all-time Knicks record for most 3PT FGM in a half (also by John Starks vs. Miami on Nov. 22, 1993 and Shawne Williams at Utah on Jan. 12, 2011)...made first start as a Knick on Mar. 9, 2012 at Milwaukee (3 pts, 18 mins); would stand as only start in his first two seasons in NY...career-high nine assists on Apr. 5 at Orlando...ejected (Flagrant Foul 2) in loss at Indiana, Apr. 3 (foul later downgraded to Flagrant 1)...season-high 25 points (7-10 from Downtown) in win over Celtics, Apr. 17…nailed seven three-pointers in first half to tie Knicks club record for second time this season...during the 2010-11 season with the Nuggets, scored a season-high 31 points vs. Pistons, Mar. 12, 2011...during the 2009-10 season with Denver, scored a season-high 41 points (10-17 from Downtown) on Dec. 23, 2009 vs. Hawks, becoming first NBA player ever to record multiple games of 10+ 3PT FGM...ranked ninth in the NBA with 159 FGM…suspended seven games, Oct. 28-Nov. 7...during the 2008-09 season, averaged 15.2 ppg over 81 games (18 starts) with Denver and finished second in voting for NBA Sixth Man of the Year award won by Dallas’ Jason Terry...scored a career-high 45 points (13-22 FGA, 11-18 from Downtown) on Apr. 13, 2009 vs. Kings...ranked fifth in NBA with 180 3PT FGM…during the 2007-08 season, established career highs for field goal percentage (.461) and 3PT pct. (.403)...during the 2006-07 season, his first in Denver, missed eight games (Feb. 23-Mar. 11) while recovering from arthroscopic surgery, left knee...served 10-game NBA suspension, Dec. 18-Jan. 8, in aftermath of Knicks/Nuggets melee at MSG, Dec. 16, 2006…in 2005-06, appeared in 55 games (25 starts) for New Orleans and averaged 7.7 points and 2.0 rebounds in 18.0 minutes…as a rookie in 2004-05, played in 76 games (56 starts) for New Orleans…averaged 10.3 points, 2.0 rebounds and 24.5 minutes. Has appeared in 90 career playoff games (25 starts) with Denver, New York and Cleveland, averaging 12.6 points and 3.5 rebounds in 29.3 minutes per game…started in all 21 games during Cleveland’s championship run in the 2016 Playoffs…averaged 11.5 points on .436 shooting, including .430 from deep, 3.2 rebounds and 1.2 steals in 34.8 minutes…made a franchise-playoff record 65 three-pointers…made at least five three-pointers six times, including two games with seven triples or more…in the First Round series against Detroit, averaged 13.5 points, including a .515 (17-33) mark from the three-point line, and 4.5 rebounds in 35.6 minutes…hit seven three-pointers on 11 attempts for 21 points in Game 2 against Detroit…in the Conference Semifinals against Atlanta, averaged 11.0 points on .500 (15-30) shooting, including .500 (14-28) from three-point range, 3.0 rebounds and 1.3 steals in 34.5 minutes; netted 3.5 three-pointers per game…in Game 2 against Atlanta, shot 7-13 (.538) from three-point territory for 23 points in 28 minutes, while also setting the Cavs playoff record for three-pointers in a half (six in first half)…in the Eastern Conference Finals versus Toronto, averaged 11.7 points, 3.0 rebounds and 1.3 steals in 31.5 minutes…nailed six three-pointers and posted 22 points, five rebounds and a steal in 37 minutes during Game 3 of the ECF at Toronto on May 21…in The Finals versus Golden State, averaged 10.6 points, 2.7 rebounds, 1.6 assists and 1.4 steals in 37.3 minutes…shot 7-13 (.538) from the field, including 5-10 (.500) from deep, for 20 points while tallying four rebounds and a game-high three steals in 38 minutes during Game 3 of the NBA Finals versus Golden State on June 8…in Cleveland’s NBA Finals run during the 2015 Playoffs, played in 18 games (four starts) with averages of 12.8 points and 4.7 rebounds in 31.1 minutes…also shot .359 from the three-point line…in the First Round against Boston, averaged 9.8 points, 3.3 rebounds and 2.3 steals in 26.8 minutes per game…swiped a playoff career-high five steals in Game 2 of the First Round against Boston on April 21…in the Eastern Conference Semifinals against Chicago, shot .444 (12-27) from deep, to go along with 12.8 points and 4.0 rebounds in 29.0 minutes…missed the first two games of the Semifinals due to suspension…during the Eastern Conference Finals against Atlanta, averaged 18.0 points on .500 shooting, including .471 (16-34) from deep, 7.5 rebounds and 2.0 assists in 33.8 minutes per game…set a Cavaliers playoff record for three-pointers in a game after going 8-12 (.667) from beyond the arc, while tallying a postseason career-best 28 points, eight rebounds, three assists, one steal and one block in 36 minutes off the bench at Atlanta in Game 1 of the Eastern Conference Finals on May 20; his eight three-point field goals were the second-most by a non-starter in an NBA playoff game (Jason Terry, 9 3FGM against LAL on 5/8/2011)…recorded his second career playoff double-double with 17 points, a career-high tying 10 rebounds and two blocks in 38 minutes off the bench against Atlanta in Game 3 of the Eastern Conference Finals on May 24…hit four triples while also notching his third career postseason double-double with 18 points, 10 rebounds and three assists in 29 minutes off the bench against Atlanta in Game 4 of the Eastern Conference Finals on May 26…in the 2015 NBA Finals, averaged 11.5 points and 4.3 rebounds in 33.7 minutes per game...in the 2013 Playoffs, averaged 14.3 points (second on the Knicks), 4.7 rebounds and 1.0 steal in 31.9 minutes over 11 postseason games...averaged 15.2 points in five games during the first round vs. Boston...ejected (Flagrant Foul 2) with 7:06 left in fourth quarter of Game 3; suspended by NBA for Game 4 (Apr. 28 at Boston)...averaged 13.5 points (second on team) in the East Semis vs. Indiana...recorded his first playoff double-double with 15 points and a postseason career-high 10 rebounds in 35 minutes in Game 6 of the second round against Indiana on May 18…in five games during the 2012 Playoffs with the Knicks, averaged 12.2 points, 2.6 rebounds, 2.2 assists and 1.2 steals in 35.0 minutes of the First Round series vs. Miami...went 8-8 from the free throw line and led the 2012 NBA Playoff leader board in FT pct. (1.000, tied with Jazz’ Gordon Hayward, 16-16 FTA, 1.000)…in five games of the 2011 Playoffs with Denver, averaged 9.8 points and 2.0 rebounds in 15.2 minutes per game…during the 2010 Playoffs, appeared in six games with averages of 11.2 points and 3.8 rebounds in 26.5 minutes per game…in the 2009 Playoffs, notched 14.9 points, 3.3 rebounds, 2.8 assists and 1.1 steals in 27.2 minutes over 16 Playoff games to help lead Nuggets to Western Conference Finals…made a playoff career-high five three-pointers and finished with 20 points in 28 minutes in Game 5 of the First Round against New Orleans on April 29…During the 2008 Playoffs, averaged a postseason career-high 18.3 points on .535 shooting from the field in 27.0 minutes over four games with the Nuggets…also shot .833 from the foul line…scored his postseason career-high 26 points on 7-12 (.583) shooting in 31 minutes in Game 4 against the Lakers on April 28…made his first postseason appearance during the 2007 Playoffs and averaged 4.5 points and 2.3 rebounds in 11.8 minutes over four games with Denver. 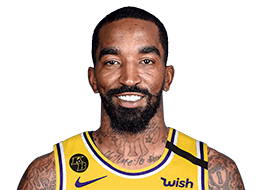 NBA Champion (2016)…named 2012-13 KIA NBA Sixth Man of the Year, outpolling Clippers’ Jamal Crawford, 484-352 in national media balloting…is the Nuggets’ all-time career leader in 3PT FGM (768)…was named Western Conference Rookie of the Month three times with Hornets in 2004-05 (January, February, March)...won one Eastern Conference Player of the Week award while with the New York Knicks (week ending Mar. 31, 2013)…only player in NBA history to record more than one game with 10+ 3PT FGM (has one 11-homer game and two 10-homer games)...has participated in NBA Slam Dunk Contest twice (third in 2005 at Denver, third in 2009 at Phoenix). Earl Smith III, known as J.R....son of Ida and Earl Smith...has three brothers and two sisters...younger brother Chris played at Manhattan and Louisville; then played alongside J.R. in two games with Knicks in 2013-14...has two daughters, Demi and Payton...played football and baseball in high school...named MVP of McDonald’s High School All-American game in 2004...named McDonald’s High School All-American in 2004...dedicated golfer.